As I near the end of my whirlwind war against boringness, I'm looking for inspiration to push the interior boundaries. Ref: celebrated American interior designer Iris Apfel. This Queens born broad was appointed to design interiors for nine US Presidents, presumably resulting in a series of White Houses that were anything but white. 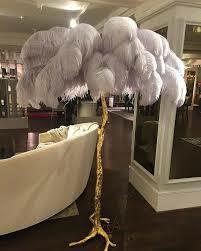 Ostrich feathered lamps feature heavily in Matthew Williamson's maximalist home. His new furniture range launches in Harrods soon. All this plumage makes my recent parrot cage purchase seem far from ridiculous. It's another second hand market steal that I bundled in through the back door hoping to escape the prying eyes of the neighbours. (Believe me, they've seen enough). They can keep the ASBO on hold however, because lucky for them I have no plans to start up an aviary. Instead the cage is my pretty new plant stand. What do you think? Like most things in my place, this is work in progress. The ideal scenario involves a lot more trailing ivy, and some pretty leafy ferns. But you get the drift. Here's more inspiration from Pinterest, this time featuring actual birds. 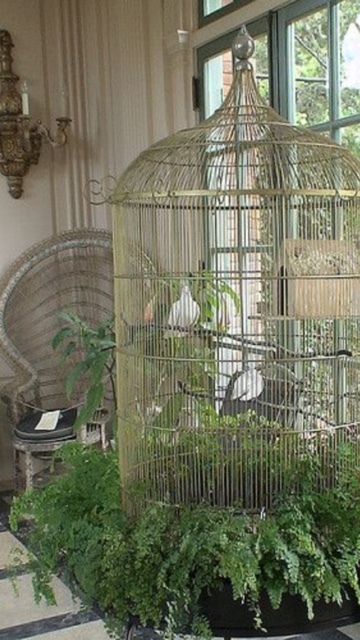 Ridiculous concept for a bird cage, right? Of course this is all very boho - the cornerstone of maximalism - but it's also a really easy way to group together leafy greens to make a much bigger and more striking statement. Smaller versions are effective too, but be sure to look for trailing plants that will spill out through the wire bars. I tried it with some cactuses and it just looked pants. What do you think? I reckon Iris (who in my head was deffo in Marilyn's squad back in the day) would definitely approve. #Teamridiculous or #teamboring. Which squad are you? Drop me a line with your thoughts.